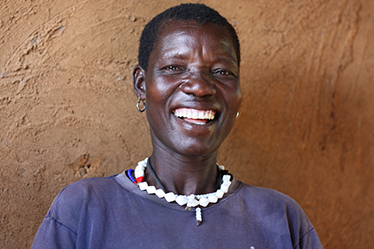 Smiley and energetic, Christine lives in the semi-arid region of Karamoja in north-east Uganda. Her husband passed away some time ago and she is now taking care of her six children on her own. Christine struggled in managing her household and securing the basic needs for her children. “I was permanently asking somebody for something,” she describes. Christine joined her Farmer Field School (FFS) group in 2011. “Through FFS, I not only learnt how to better manage my activities, but also how to understand the right timing for sowing, how to use fewer seeds with the same final outcome and how to set up a marketing strategy,” says Christine. Farmer field schools are schools without walls. They are centered on the concept of hands-on learning with the goal of building on farmers’ skills and enhancing their capacity to critically analyse and solve local agricultural challenges. In FFS, farmers are the experts. It is the farmers who decide what is relevant to them and what they want the FFS to address in their curriculum. This ensures that the information is relevant and tailored to the participants’ actual needs. The FFS promote the idea that learning is unique to each person and that, in order to promote new learning, prior experience must be taken into account. “We not only have our vegetable garden that secures a significant income for us, but we also use a rotational system where the group works together in one person’s field and then continues in another one’s,” explains Christine. The field, herd or the landscape is the main learning ground, around which FFS activities are organized. Farmers learn directly from what they observe, collect and experience in their surroundings. They produce their own learning materials (drawings, etc.) based on their observations and experiences. All six of Christine’s children are in boarding schools in nearby localities. The purpose of FFS is not only to build the technical capacity of farmers but also to contribute to community development including gender equality and social inclusion. Asma’s home is Safi, south of the Dead Sea, in Jordan where she lives with her family. Asma was 24 when she was invited, together with her brother, to join the FFS group on tomato production. She was one of the two women in that FFS group. Her skills improved rapidly, and Asma found that she could express her opinions more clearly and communicate more openly with other group members, most of whom were men. After three years of participating in the FFS, Asma became an FFS facilitator. There are seven other female farmers that started agricultural activities with Asma’s help. She became an example for them. Her sisters, Zeinab and Wisal, also joined this FFS women’s group. By building the confidence of both women and men, the FFS process enhances individual, household and community empowerment and cohesion. There are also Junior Farmer Field Schools (JFFS) that train the next generation in sustainable agricultural methods, to strengthen their future livelihoods and food security. These schools help give vulnerable young people a community to tap into and a foundation in life skills that are invaluable for a better future. Every FFS includes at least three activities: agro-ecosystem analysis, a ‘group dynamic activity’ and a ‘topic of the day.’ The group dynamic activity focuses on team building and organizational skills while the ‘topic of the day’ usually includes technical information, normally related to farming but could also include any other subject of concern to the group members. 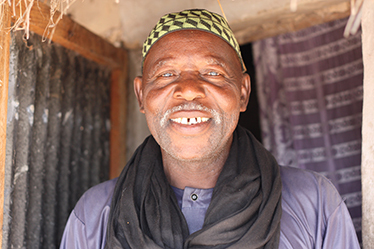 Arouna lives with his family in the Tambacounda region of southeastern Senegal where two thirds of the population live under the poverty line compared to national average of less than 50%. Arouna and his wife joined the local FFS in 2015. He explains that the FFS helped him to understand how important it is to know others, to communicate and to look for consensus. “One of the basic FFS principles is that a decision has to be taken together,” describes Arouna. This principle of building stronger communities who work together is an important goal of FFS. In 2017, FAO set up the Global FFS Platform, in collaboration with over 15 external partners, to connect the growing network of practitioners and organizations using FFS. The aim of the platform is to strengthen the quality of FFS by facilitating the exchange of knowledge, expertise and innovation among its users. The platform includes a library of more than 300 FFS resources, online profiles of FFS experts and a global email discussion group with over 900 practitioners from 100 countries. FFS today are being implemented in over 90 different countries. They have improved the skills of over 4 million farmers, pastoralists and fishers worldwide, who are our heroes in creating a #ZeroHunger world. We cannot hope to achieve a world free from hunger without supporting those who produce our food.